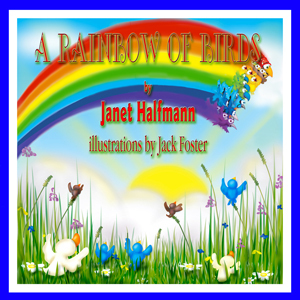 A Rainbow of Birds by Janet Halfmann, illustrations by Jack Foster. Guardian Angel Publishing, Inc., St. Louis, Missouri, 2014. Long ago, birds were even more active after a rainstorm than they are today. The cardinals were the first birds to fly up after a rainstorm “…forming a band of beautiful bright red.” Robins were next with their orange breasts, joined by yellow warblers, green parrots and blue jays. Indigo buntings and purple martins finished off the rainbow. This book includes a section titled “Rainbow Facts & Fun” with an explanation of how rainbows are formed and fun projects for kids to try. They can make their own rainbows with a garden hose and watering nozzle, learn to mix primary colors or research other rainbow stories. Many cultures have an origin story explaining this natural phenomenon. This book will appeal to children of all ages, especially with the experiments in the back of the book. The colors alone will fascinate babies. The only thing that confused me was Papa Cardinal’s large beak. When I first saw it I thought he was a toucan. But that is a minor point in an otherwise lovely and fun book that will delight readers both old and young. Thanks so much for the lovely review. Wishing everyone lots of fun rainbows this spring and summer!